Here, for a change, is an offer with very few strings attached. 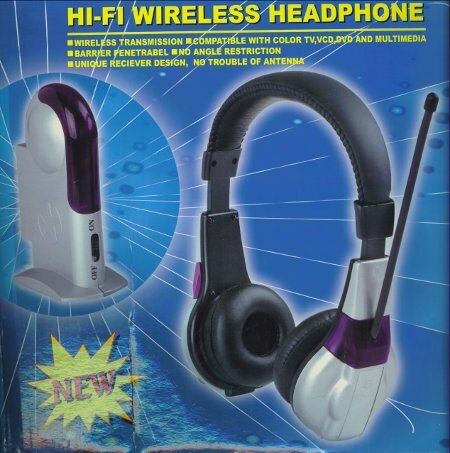 Just plug the wireless headphones transmitter into your computer, monitor, TV, DVD, in fact anywhere you have a stereo socket. The transmitter then communicates using radio waves, so you can hear through walls, and at obscure angles, and around the house at up to 30 metres range. If you are comparing, have a look at the positioning of the antenna, this one is designed to be as hassle free as possible. It can make a big difference in use and enjoyment. The transmitter runs off a 9v AC transformer, we throw in a UK one, but one of those multivoltage adapters you probably have around would do the trick. The wireless headphones use 2 x 1.5v. Wireless Headphones text, images and video are copyright.